With just the phone in your pocket, you can email your boss in Gmail and then ask your kids when they’ll be home using Hangouts. You can follow up with a new client in Salesforce and pull up your tax documents in Drive. Everything you do, whether it's for work or your personal life can all be done from the device you always have by your side. That’s pretty powerful and can save a lot of time. But with great power comes great responsibility, and keeping that information secure requires some attention — whether it’s keeping your tax documents private to yourself or your email conversations secure within your company. That’s why last week we made Android ready for work — making it easier for the more than one billion Android users out there to access the apps they need to be productive on their phones and tablets. 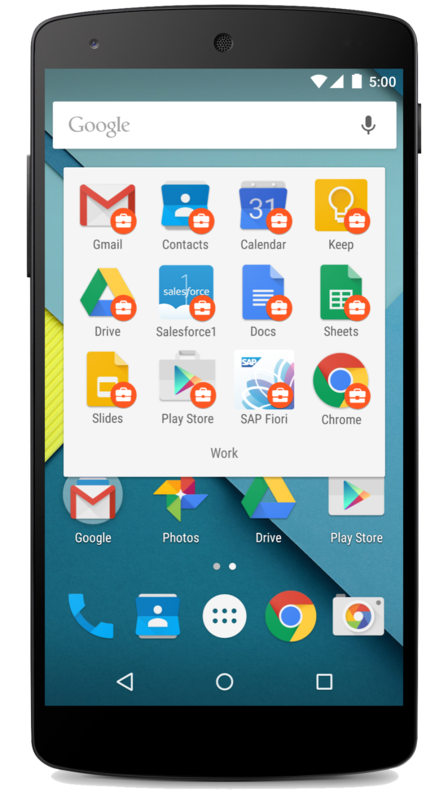 Today we wanted to highlight the ways Google Apps Mobile Management let’s you take full advantage of Android for Work. Phones get lost. Tablets stolen. People leave the company. Things happen. We believe you should have the tools to keep your work data safe, and that this safety should just be built in to the applications you choose. That’s why mobile device management — across Android and iOS — is included with Google Apps and Google Drive for Work. Apps Mobile Management allows admins to see what devices are connected, require device passwords and remotely wipe data when necessary. As the domain administrator, with today’s launch, you can now choose the level of data separation that works for your organization. Whether it’s a personal device or a corp-issued one, with Android for Work, you can have all your employees create a Work Profile that isolates and protects work data from other activity on their phone. Or make it a choice, and let employees continue to switch accounts within Gmail and other Google mobile apps, while using the Work Profile for non-Google work related apps. Either way, all their work information is encrypted and can be remotely wiped. The Work Profile keeps all work approved apps separate from the rest of the phone. Google Play for Work makes it easy for employees to see what apps are approved by their company and install the apps they want onto their device. Once an admin enables Android for Work, anyone can choose to use the Work Profile, even if not required to. So their own information stays private while the company can enforce Mobile Management policies for work accounts if needed. 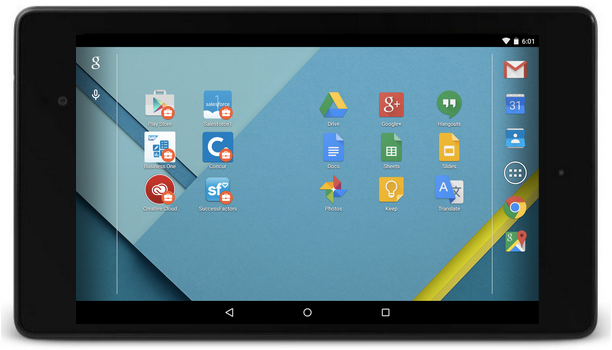 Install work apps from Google Play for Work and keep them on your homescreen. With Google Apps Mobile Management, you can have choice and security at the same time. Your employees can choose the device they’re comfortable with that helps them get work done, and you have peace of mind that company information is secure. Android for Work and Apps Mobile Management is available for all Google Drive for Work and Google Apps for Work, Government and Education organizations. Learn more in the Admin Help Center.